A truly remarkable fertilizer made entirely of squid. 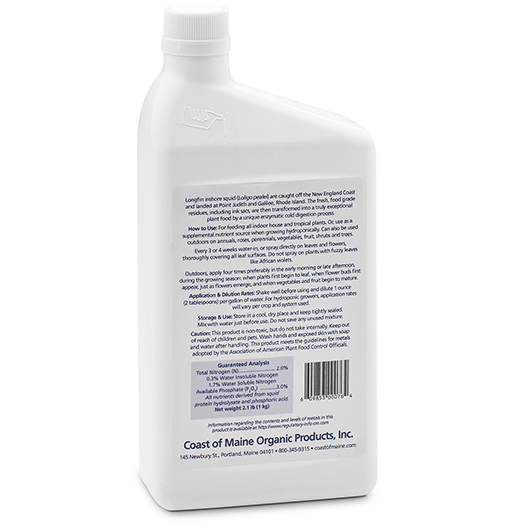 A highly concentrated liquid fertilizer intended to promote budding and blooming. Can be used for greenhouse and hydroponic systems and indoor and outdoor applications. Available in pints, quarts, gallons and 2.5 gallons. Longfin inshore squid (Loligo pealet) are caught off the New England Coast and landed at Point Judith and Galilee, Rhode Island. 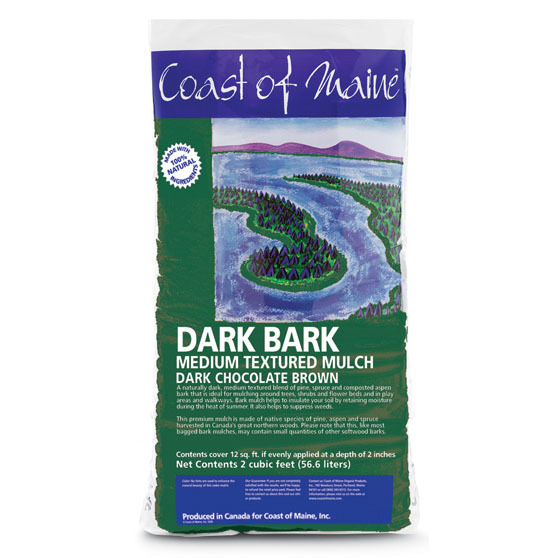 The fresh, food grade residues, including ink sacs, are then transformed into a truly exceptional plant food by a unique enzymatic cold digestion process. How to Use: For feeding all indoor house and tropical plants. 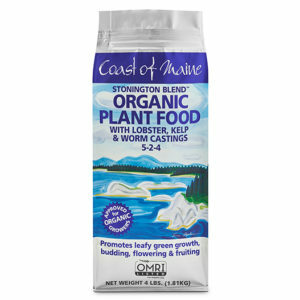 Or, use as a supplemental nutrient source when growing hydroponically. 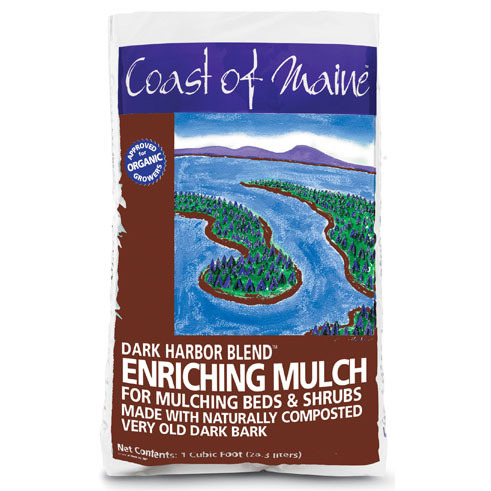 Can also be used outdoors on annuals, roses, perennials, vegetables, fruit, shrubs and trees. 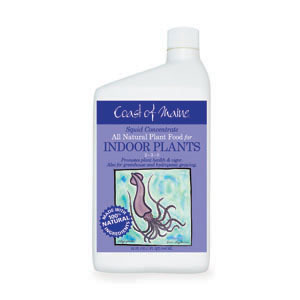 Every 3 or 4 weeks water-in, or spray directly on leaves and flowers, thoroughly covering all leaf surfaces. 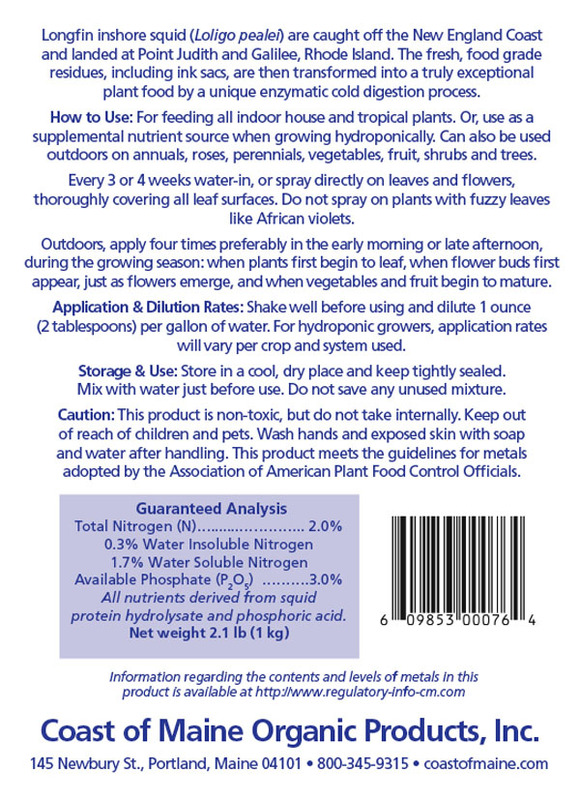 Do not spray on plants with fuzzy leaves like African violets. Outdoors, apply four times preferably in the early morning or late afternoon, during the growing season: when plants first begin to leaf. when flower buds first appear, just as flowers emerge, and when vegetables and fruit begin to mature. 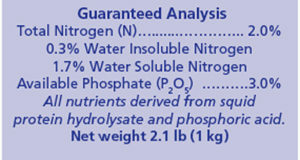 Application & Dilution Rates: Shake well before using and dilute 1 ounce (2 tablespoons) per gallon of water. 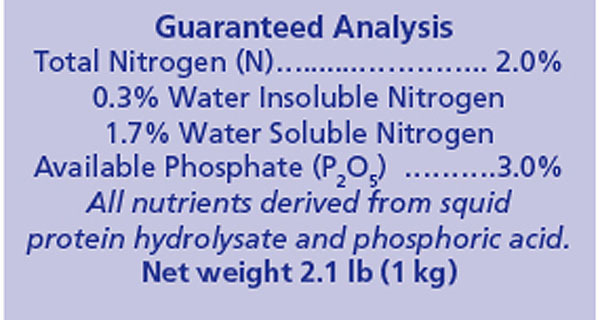 For hydroponic growers, application rates will vary per crop and system used. Storage & Use: Store in a cool, dry place and keep tightly sealed. Mix with water just before use. Do not save any unused mixture.